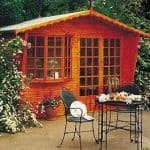 For the person looking for a summerhouse that has that old school, vintage or if your prefer just classic British look. They will no doubt think they have found it the moment that they lay their eyes on The Lavenham Summerhouse. Rather than following the same path that most other modern summerhouses do, Crane have designed the Lavenham to look like it has been plucked out of an old timey East Anglian garden. 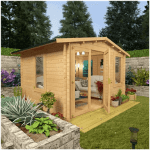 Made with some of the finest and most top of the line materials and designed with impeccable attention to detail this really is a summerhouse that makes a strong and long lasting impression. It is almost like Crane had a checklist of what went into making a summerhouse from many years ago and as a result the Lavenham is just full of unique, interesting, high quality and just really cool features like a corrugated roof, classic “British” style, sawn board cladding and to ensure it will be still standing strong after many years it is built from the finest, Scandinavian Redwood. Crane do say it can take up to 12 weeks for delivery! 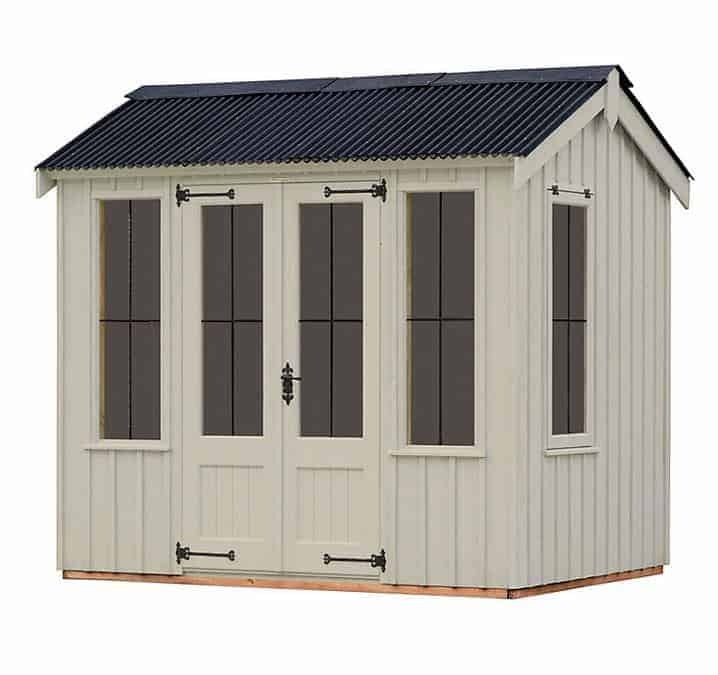 Hey we know that this is a summerhouse that looks so nice that it really does nearly seduce you into hitting that “buy” button right away. But we have rolled up our sleeves, had a good look around and will let you know exactly what the deal with the Lavenham Summerhouse is! This is what we call a “compact” sized summerhouse and it is actually the smallest size that the Lavenham Summerhouse is available in. Most of the floor space here is in its length which is 7 feet 8 inches. The width is 5 feet 9 inches, we understand that this at a glance looks like not a great deal of space, but actually once you are inside it does feel more spacious. It just means that you will have to be a bit more crafty, smart and really think about how you are going to lay everything out. At the highest point at the ridge, you have around seven feet in height so there is no need to duck…… well unless you are really tall of course! The Eave height is right around the six foot mark so truth be told the summerhouse does have a nice amount of head room. Words cannot say how much we love the roof (but we will try!) a corrugated roof is what most summerhouses and sheds would have back in the day and that is why Crane are using that here. This is an apex style roof which gives you a nice amount of headroom, but also serves as a great protector against the rain which as we live in the UK is something we need! 19 x 125 mm tongue and groove boarding is what is underneath this lovely, corrugated roof. Also to make sure when you are sitting and relaxing that you do not have to just stare up at that roof boards, you have a nice pine effect ceiling that just finishes off the inside of the summerhouse perfectly. We love when a company go all out and use some real, high quality wood to construct their summerhouse and that is what Crane have done by using, Scandinavian Redwood all through the summerhouse! Sawn board cladding, we will admit right away made us scratch our heads and ask “why” but once you see how great it looks and how with that corrugated roof it really does give the summerhouse the old style look that Crane were going for, you all of a sudden “get it” and see exactly why they used this style of cladding. The cladding is 12 x 150 mm and has a topping (to add some extra style and give a little bit more oomph!) of 16 x 38 mm. 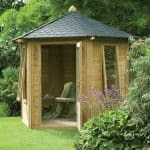 To make sure that your summerhouse will be still be a strong and prominent feature in your garden for many years, Crane have used that same Scandinavian Redwood for the frame. The frame is 19 x 50 mm and it is a nice frame that will offer you years and years of support. 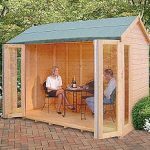 Look it may seem not the most interesting feature to talk about, but when you have seen as many flimsy and weak summerhouses as we have, you are always happy to see a summerhouse with a strong backbone. Like most of the summerhouse in their National Trust line, Crane are using the exact same type of boarding for the floor as they have the roof. 19 x 125 mm is a good thickness and as it is made from that excellent, Scandinavian Redwood we are pretty sure that it is going to be more than up to taking a few chairs, a table or whatever it may be you will be putting in here. We were very impressed with the 38 x 50 mm floor joists which really do make the floor feel strong and secure and are another piece of the jigsaw when it comes to making this a long lasting summerhouse. 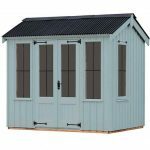 We do not think that you should have any problems with the Lavenham Summerhouse, but just in case you do there is the standard, Crane two year warranty to watch your back. This warranty is for what Crane class as general wear and tear so if there is some kind of issue then you just call them up and they will come and fix it. Now there are some things you need to watch for like, accidental damage is not covered for example. But also be sure to not insist they build on a part of your garden they have warned against as this can void your warranty. Double doors really do make this an inviting summerhouse. These doors are made with expert craftsmanship and are a nice, 1100 mm high and 1830 mm wide. When both are open, you will have no worries at all in getting things in and out of here. Let’s face it no one likes having to twist and turn things to try and get them through a door! Each door has a nice window on it and to really make them come to life and stand out, Crane have used these cast iron, Fleur-de-Leys hinges which will keep those doors where they are supposed to be for many years. The door handle and the lock are done in the same kind of style as the hinges and it really does look lovely. Windows are a huge feature of the Lavenham Summerhouse. We have six large windows here with the two on the doors being just a little bit smaller than the other four. All six are made with actual glass which is something we think is really cool as most summerhouses these days will cut costs by using some kind of plastic! This is not cheap glass either. It is 4 mm thick and tough as a wrestler! While the glass is strong it also has a nice look thanks to the lead cross effect that is used. There are four (including the two that are on the doors) windows on the front and two on the sides. The ones on the side actually open up to help get a little bit more air in the summerhouse. Of course you are going to be having some nice furniture inside here, but to make sure that once you are done, everything is kept nice and safe, Crane have a mortice lock on here that of course will keep the door locked, but it actually looks great as well. These large windows may offer what some deem, a lack of privacy, but we think that a set of blinds would not take away from the look of the summerhouse and give you that extra bit of privacy should you want it. Crane take a lot of pride in this summerhouse and they clearly want it to be something that would fit in any kind of garden. So with that in mind they have six different colours for you to pick from. These are very nice colours and we are more than sure that there will be that perfect colour for your garden. Disraeli Green, Painters Grey, Dome Ochre, Terrace Green, Earls Grey and Wades Lantern are the colours that you have to choose from. No one can ever say that a Crane shed or summerhouse is not high quality! 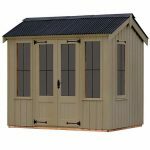 When you know Crane have made a summerhouse then you can rest assure that you are getting something that is just absolutely top class in every regard. Scandinavian Redwood looks great, but this wood will also stay strong for just an incredible amount of years. As well as using the best materials (which is part of the reason the price is what it is) Crane will be the ones building it so that also adds into this being a summerhouse that will last for many years. Look if this summerhouse was half the price then we would have scored this section a little bit higher, but for this price 8 x 6 really is not a lot of space. We are sure that with some clever planning and care that you really can make the best of the space you have here, but it will take some work on your part. Crane handle everything themselves which is one of the many advantages of buying a Crane shed. 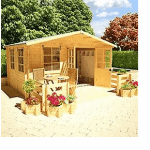 They will build it the right way which just helps add to the summerhouses stability and will also mean you do not have to get all hot, sweaty and probably bruised up trying to build it yourself! Clearly just from the photos you can all tell this is a lovely looking summerhouse, but the price is very high. This is a top of the line and expensive series of summerhouse and while it is built with the best materials we do feel for the size of the summerhouse the price is certainly on the high side. Final Thoughts: Look we do love how this looks and are sure it would pretty much fit in any style of garden. The materials used are fantastic and the fact Crane will deliver and build it for you is awesome……. But we just have a hard time getting over how expensive it is. 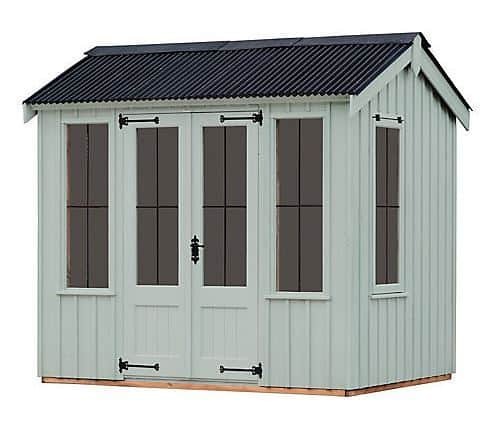 Yes it does look nice and it certainly has that old school charm Crane were going for, but over 4 thousand pounds for a summerhouse of this size is a heck of a lot of money so we would certainly recommend some deep thinking before you pull the trigger on this.